High-performance piston aircraft avionics just took a big leap forward. The G2000 is our premium glass flight deck for piston aircraft, bringing a touchscreen user interface, graphical flight synoptics, enhanced situational awareness and more to the cockpit. At the heart of the G2000 is our GTC touchscreen controller. Familiar “desktop” style menu icons and a shallow menu structure let you easily locate and activate all primary pages, functions and controls on the 5.7" high-resolution display. With a few taps of your finger, you can manage your NAV/COMM radio, go over electronic checklist entries, review terminal procedures and charts, edit your flight plan, access synoptic data and other selected mapping, traffic, weather, entertainment and custom display options*. The system can operate select remote audio/intercom systems and transponders, and also has the capability to control aircraft lighting, heating or other environmental technologies. Plus, FBO, ground transportation, lodging and other facility information for most U.S. airports are available through preloaded AOPA Airport directory data; international pilots may opt for global AC-U-KWIK airport directory data instead. The GTC controller can even double as a standby flight display in some configurations. 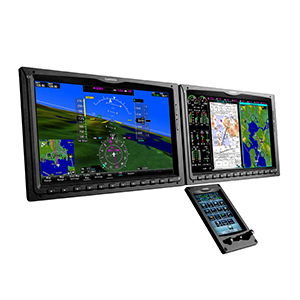 With 12" or 14" widescreen displays, the G2000 puts an incredible amount of flight information right in front of you. LED backlighting and sharp colors make the displays exceptionally readable, even in bright sunlight. Each unit can function either as a primary flight display (PFD) or multifunction display (MFD) — or in reversionary mode as both. 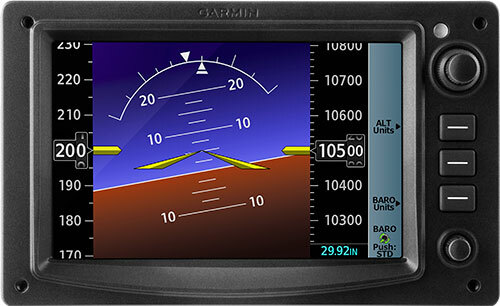 In PFD mode, the wide aspect ratio allows you to not only see full 3-axis instrumentation with HSI, altitude, climb/descent and airspeed, but also allows for insets of optional traffic and terrain/obstacle data. The wider screen also provides more area for SVT, which provides a 3-D “virtual reality” perspective of what lies beyond the nose of your cockpit, including ground and water features, obstacles and traffic. The G2000 can be configured to replace a range of engine, temperature and fuel gauges in your panel with a fully integrated array. Graphical synoptics show engine trend, airframe, electrical and fuel data. The MFD can also display data from a GTS™ series traffic system and GDL 69 XM® satellite receiver (both sold separately), as well as preloaded FliteCharts® and SafeTaxi® charts and diagrams. Pilot-selectable split-frame capability allows you to view 2 separate screens simultaneously. For example, you can pull up an approach plate and continue to track your progress on a moving map simultaneously. The G2000 is highly configurable and upgradeable to support a number of additional capabilities. With a compatible autopilot system, the G2000 supports our Electronic Stability and Protection (ESP), which helps protect against stalls, spins, overspeeds and more. With a GMA™ 36, you can gain advanced auto squelch, 3-D Audio and automatic volume control. And with a GSR 56 satellite datalink and required subscriptions, you can get global weather and communications capabilities through the Iridium network.